Occupation: I am a receptionist and concession worker in the morning and a professional photographer by night. I work at a sports dome answering phones and selling popcorn to your children, and on the weekends I am photographing or doing video for weddings! I also do freelance design of weird sorts and nearly anything else to bring in some green. 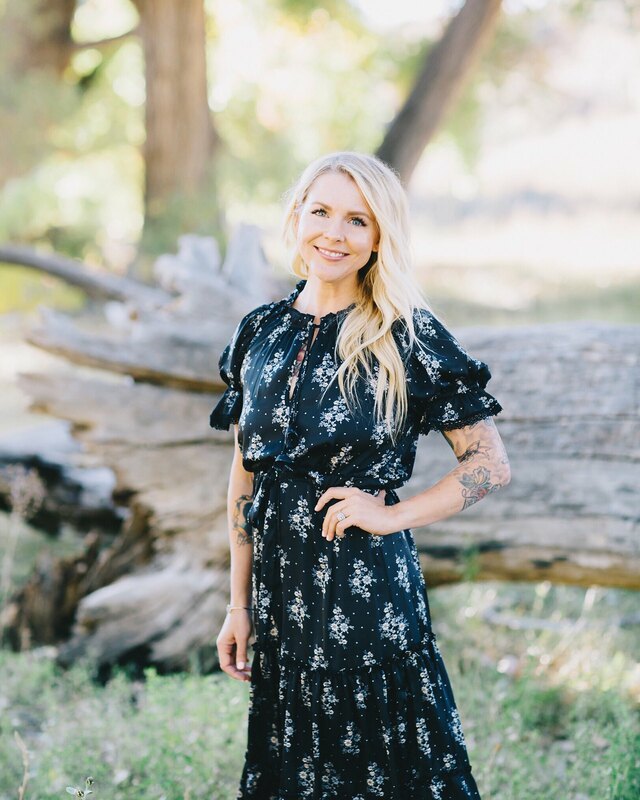 Favorite tattoo: Tough question! I'm not so sure that I really have a favorite. They all have different meanings to me, but none really stand out more than others. 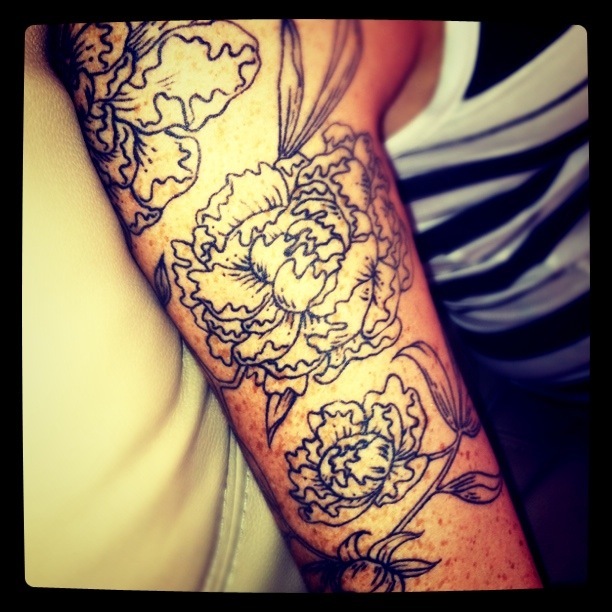 Featured tattoo/location: Peonies on my right arm. 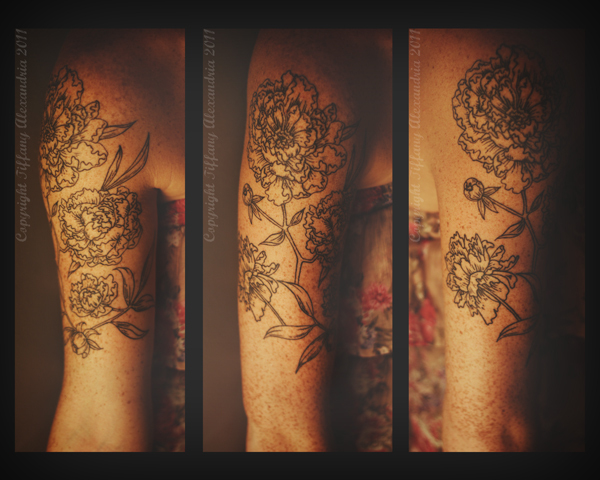 Artist/shop/location of feature tattoo: My Peony tattoo, located on my right arm, was done up by Jason at American Inkwell in Pekin, IL. One of my most vivid memories from the only place I'll ever call home were the Peony bushes in the back yard. I can remember always being so fascinated at the beauty of them. I have no idea who planted them, or when, but they were the most beautiful flower I had ever seen. It's more of a random memory I have, but it means enough to have it tattooed to the front of my arm. I never want to forget being able to find beauty in the small things! I went through the " I love this band and that band " phase and decided that I would get the idea from the cover of a CD. It was the first CD I can remember ever being able to listen to every single song all the way through and absolutely love each one. Therefore, the outline of a dead man floating to heaven made his way to my right rib cage. 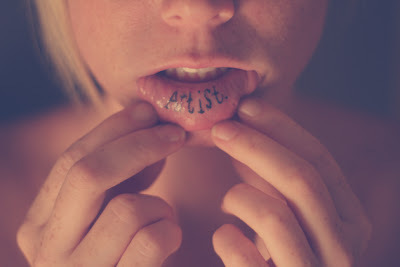 You'll find my third tattoo on the inside of my lip. "Artist." I did this shortly after moving back from Massachusetts While hoping for a reminder of who I am, it seems to get lost quite often considering it's not the most visible tattoo I have. I also have yet to master the "is this still a cute photo even though we're looking in her mouth?" pose yet with this one...Any ideas?! Fourth tattoo is located on the back of my neck. 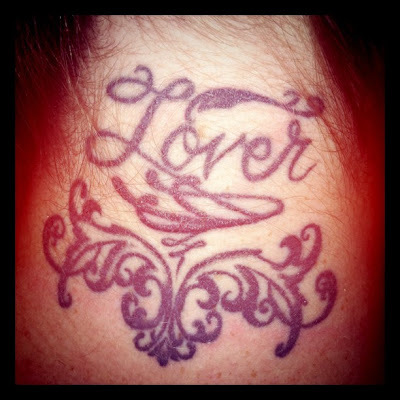 "Lover" it reads. I got this tattoo under a meaning of something I feel like I'll never really fully be able to explain to anyone. It means more than "lover" of just one sort. It helps to remind me that I have a passion for more things I could ever list off and that's really my purpose in life. 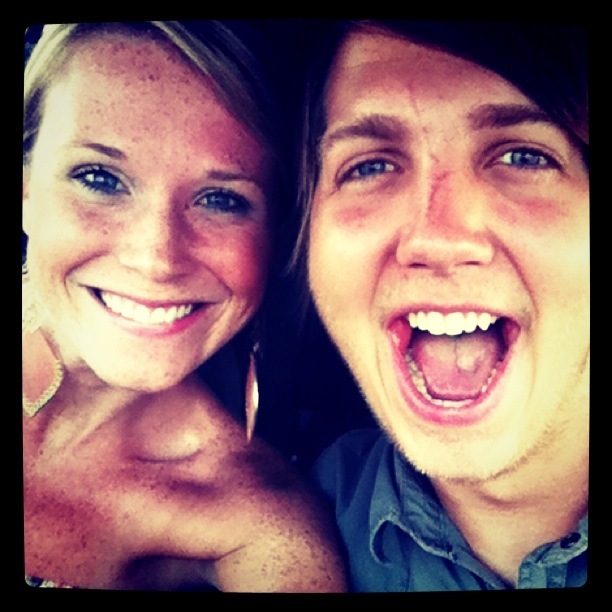 To love. Of course! I need to finish my Peonies and then I'm sure I'll add elsewhere. I don't have anything in mind at the moment, but like most of my other tattoos, I'm sure they will come on a whim. The only thing I have planned out is where I DON'T want any future tattoos! 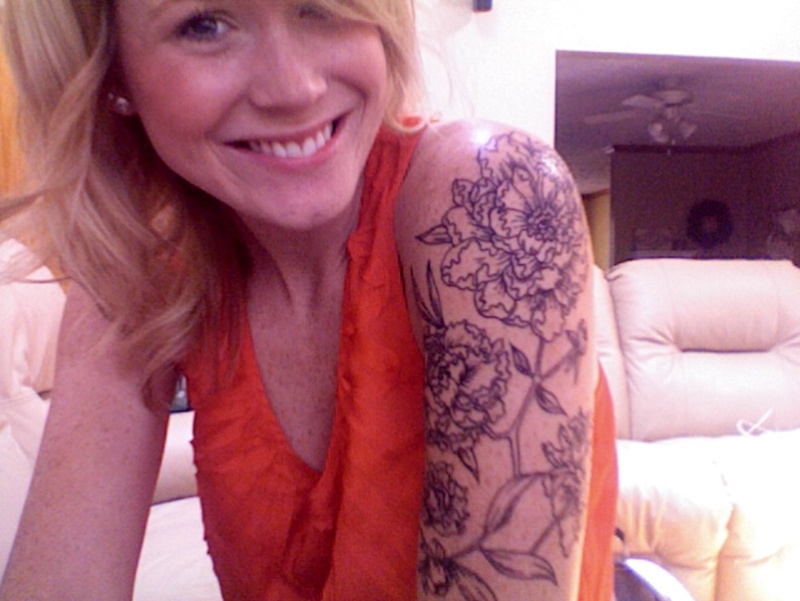 I think when I finish my right arm, I will probably wait until after the 'ol wedding day to get more. I don't mind other people being all tattooed up for that occasion, but I just can't see myself as one of them. I'm currently happy with what I've got! After getting my first tattoo while in college), I knew I would have some sort of battle to go through when my parents found out. Of course I ended up getting my lip pierced out there as well, therefore, already hinting that I probably went all out and got ink too. Parents were not thrilled about it and to this day still don't understand why I do it. Yes. Definitely research and read comments and / or ask around about the artist you are going to choose. It's just not worth it to go to someone because you're too anxious. When I went for my dead guy tattoo, it was during a phase I thought I would be in the rest of my life. Boy did that ever change! I can't say I regret him, however, I could probably think of a few cooler things to put there now :) It's always worth sitting on just a little longer though. No need to rush! She's a very cute girl!nice post to read..
but i support all the tattooed girls!! Idea for inside-lip picture: do two pictures paired together. One is the inside of the lip (that picture looks fine, I like the lighting), and the other maybe something where it's obvious she's running her tongue on it, but she has a smile or something (I like the idea of keeping the eyes out of the photo for some reason) going on that makes it curious. First you think "Oooo what's she thinking about/fiddling with?" and then you see it. The way she feels about her dead guy tattoo is how I feel about my backpiece. I totally get the "I could put something way cooler there" thing. There's definitely a learning curve in getting tattooed. Oh my gosh! I can't believe she got that tattoo in Pekin, IL....THAT'S WHERE I LIVE!!!! It's not a super large town, so that's pretty amazing to have that connection! Love this feature...hope to read a lot more! Those peonies are gorgeous, much love to the black and gray! I love her flowers! Very beautiful! great post! such lovely tattoos - bold but feminine. thanks! Props to her for getting a tat on the inside of her lip! That seems like the most painful. I love your peony tattoos, I love tattoos that are just outline, and peonies are very special to me as well. Beautiful! ps. I don't think your stomach tattoo is too big, it looks pretty. Oh god....these girls are crazy.Tattooing is a passion i think.She has tattoo inside her lower lip.Thats crazy....Although the designs of all the tattoos were very nice.